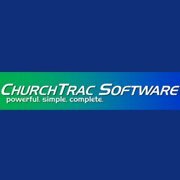 ChurchTrac is a software program that was created to be a blessing and help to Christian-based churches and ministries. As a company, our belief system is entirely Christian in nature, and our business practices, as well as the content of our products, will reflect this belief. You can visit their business site (http://www.churchtrac.com/) here. 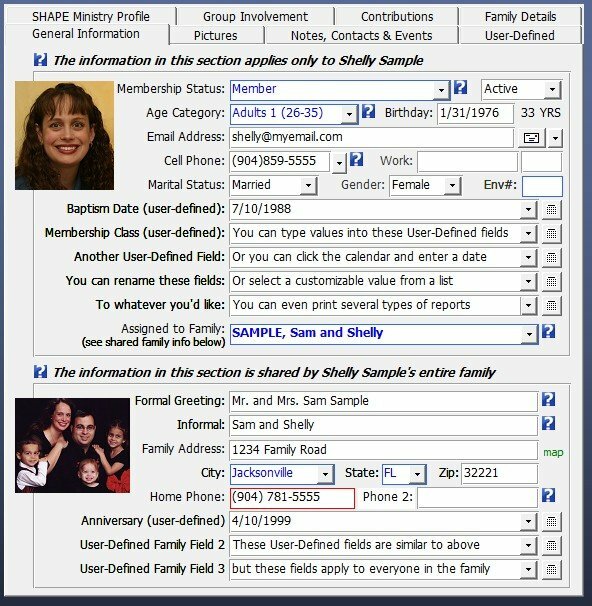 The People Screen: The People Screen allows you to keep track of everyone associated with your church. 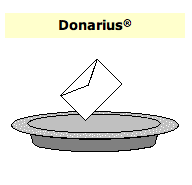 The People Screen is organized so that there is a list of information on the left side of the screen, with details about the selected name on the right. Print Reports, Labels, and More: The Output Options button on the people screen opens the Output Options window, which gives you quick access to reports, labels, letters, emails and more. Find Names Quickly: You can also use the advanced filter/search feature to find people based on just about any criteria imaginable–like everyone who has the spiritual gift of teaching or anyone who enjoys painting. Notes and Events Tab: The Notes, Contacts & Events tab is a good place to store quick notes or information about an individual or family. You can customize the note categories, and print reports based on your entries. 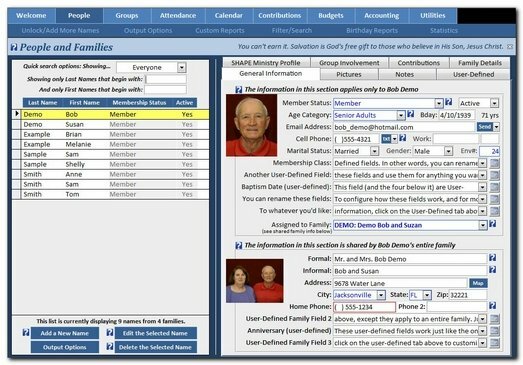 User-Defined Tab: The User-Defined tab lets you create your own fields–10 for individuals and 6 for families–that you can rename and customize to your specifications. 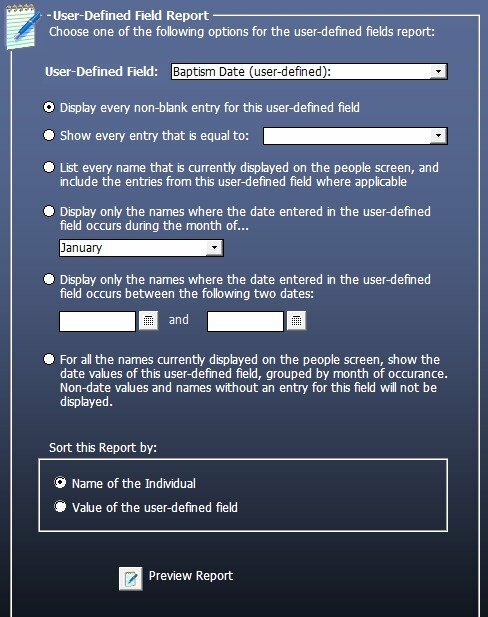 You can also print detailed reports based on the information in each user-defined field. 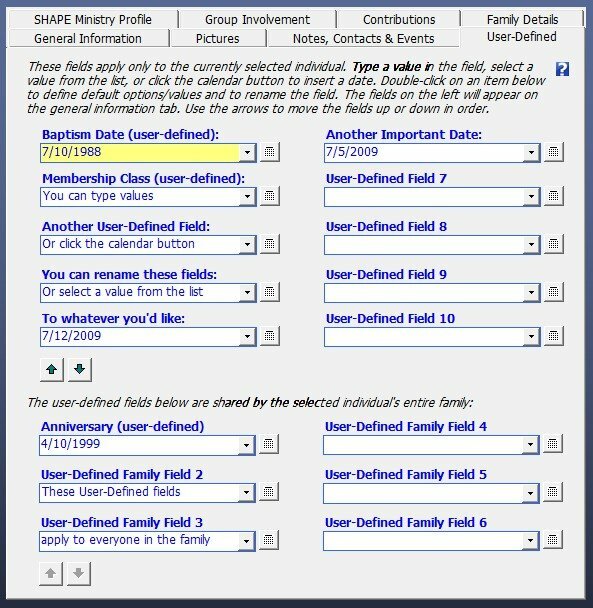 Ministry Profile Tab: The SHAPE Ministry Profile tab gives you a place to enter Spiritual gifts, Heart for ministry, Abilities, Personality traits, and Experiences for each person in your congregation. You can customize each section to match the ministries and needs of your church. 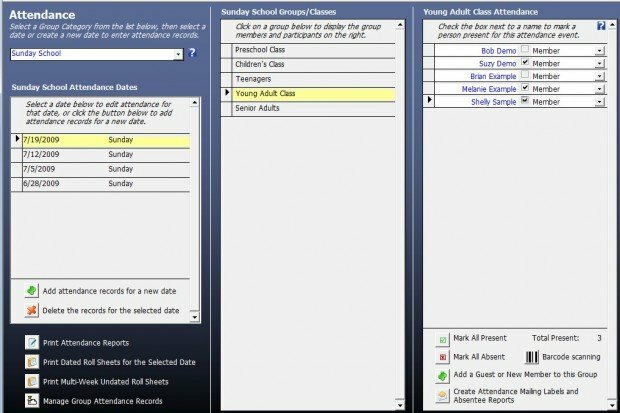 Groups Screen: The Groups Screen gives you access to all of the groups in your church: Sunday school classes, committees, teams, small groups, and ministries. You can assign people to multiple groups, track group expenses, automatically promote members to a new group when they reach a certain age, and more. Accounting and Budgeting: ChurchTrac includes basic accounting and budgeting features to assist churches in managing their finances. You can create accounts, transfer funds between accounts, write and print checks, assign transactions to categories, and reconcile accounts.